Her Royal Highness The Countess of Wessex will visit Agrifest South West at Westpoint, Exeter on Wednesday, November 8. The Countess is the President of the Devon County Agricultural Association (DCAA) which is supporting the event that showcases high quality beef and sheep farming in the South West. Vicky Smith Secretary of Agrifest South West said she was ‘delighted and honoured’ that The Countess would attend their eighth show. “I look forward to demonstrating the work of beef and sheep producers in the South West to The Countess of Wessex and for HRH to have the opportunity to see the role of The National Beef Association first hand,” said Vicky Smith. 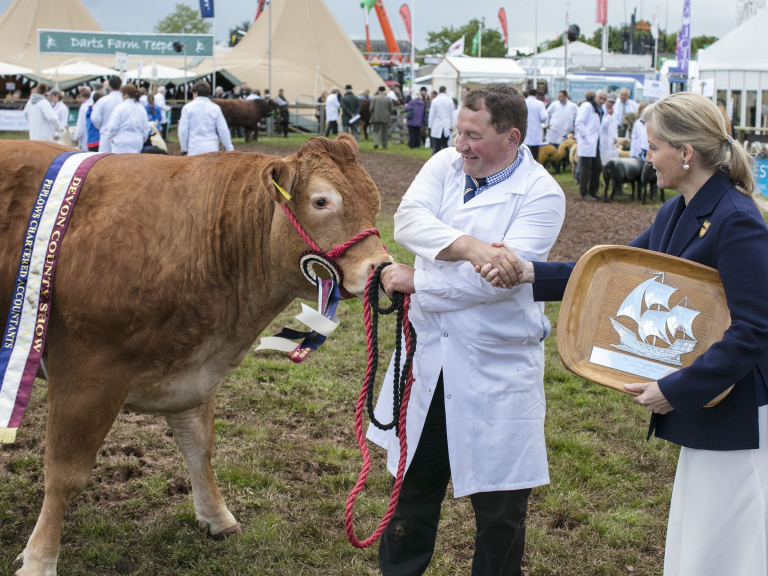 The show, organised by the National Beef Association South West, includes livestock classes, steak and burger awards, seminars and farm safety demonstrations. This year’s highlights are new prime lamb classes, the support of The Royal Smithfield Club which promotes livestock breeding, more classes in the pedigree calf show and charity auctions. The Countess is a keen supporter of British agriculture and is 10-months into her one-year term as President of the DCAA, which organises the Devon County Show. Photo cap: Her Royal Highness The Countess of Wessex congratulating Michael Alford of Foxhill Farm, near Cullompton, whose two year old in-calf Limousin heifer, Corranhill Krystal, took the 2017 interbreed championship for beef cattle at the Devon County Show.